Today I had to try and find a virtual machine given its MAC address on a non-clustered Hyper-V environment. Here’s a quick PowerShell script to do just that! Put your Hyper-V server names in the $servers variable and then run as a user who has remote access to each of those servers. 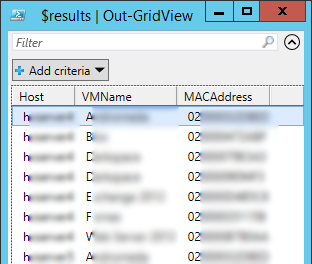 You can then use the filter box at the top to find your chosen VM – pretty handy! Get-VM –Computername $hvs | Get-VMNetworkAdapter | select VMName, MACAddress ,ComputerName | …. And show them as a nice grid!